Results from the Bastyr University Patient-Reported Outcomes in PD (PRO-PD) survey were shared at WPC 2016. 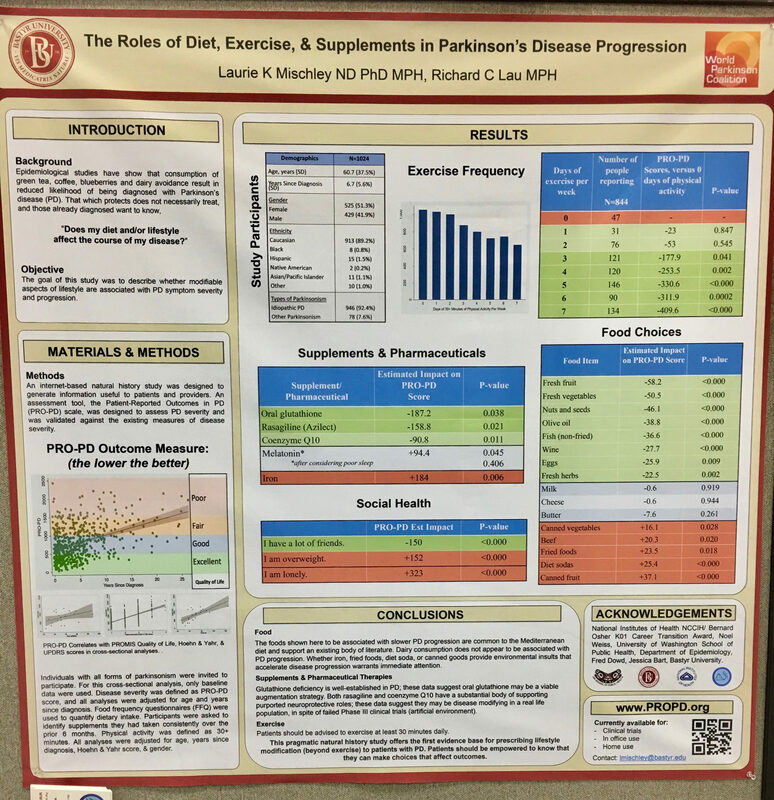 The survey asks PwP about their diet, exercise and supplement regimens, and correlates this information with a self-assessment of PD progression. The survey results indicate that the more days per week that a person exercises (up to and including 7 days per week), for at least 30 minutes, the slower the PD progression. Before you start a 6 or 7 day per week program, please don’t do the same exercise routine every day. Focus on different muscle groups so that you are not overworking particular muscles, and not neglecting any muscle groups. In the past, a lot of recommendations for PD exercise have been based on the minimum recommendations published by the USA Centers for Disease Control and Prevention (CDC) and American Heart Association (AHA). In fact, many of the recommendations that I have seen have misunderstood these minimum recommendations, focusing on 30 minutes of moderate intensity exercise 5 days per week, but ignoring the additional recommendation for muscle strengthening activities at least 2 days per week. Note that the recommendation also allows for a mix of moderate and vigorous intensity aerobic activity, where 2 minutes of moderate intensity equals 1 minute of vigorous intensity. The recommendations don’t stop there. There is no upper limit to the recommendation. Of course, it is extremely important to avoid injury. You should consult with your doctor before beginning an exercise program. I also highly recommend working with a personal trainer and/or physical therapist, depending on the severity of your PD. It’s also important to vary your exercise routine and allow rest/recovery for over exerted muscle groups. There is a saying that you should listen to your body. The CDC recommendations are for healthy adults, so you’re probably wondering if they also apply to PD. Exercise is an important part of healthy living for everyone. However, for people with PD exercise is not only healthy, but a vital component to maintaining balance, mobility and daily living activities. 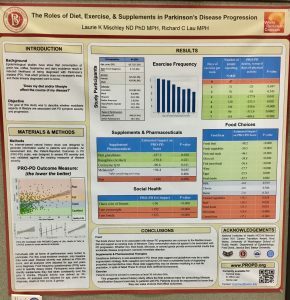 “One Parkinson’s Outcomes Project” study has proven that people with PD who vigorously exercise for 2.5 hours per week show a slowed decline in quality of life, and the sooner they begin vigorous workouts after diagnosis, the better. The best way to achieve these benefits is to exercise on a consistent basis. People with Parkinson’s enrolled in exercise programs with durations longer than six months, regardless of exercise intensity, have shown significant gains in functional balance and mobility as compared to programs of only two-week or ten-week durations. One of my trainers would definitely say that if you have to ask, you’re not exercising hard enough. Obviously, everyone has a different level of fitness, so brisk walking may be vigorous intensity for some and moderate for others. How do you measure this intensity? According to the American Heart Association, for most people, increased heart rate correlates directly with the level of exercise intensity. For this reason, using a heart rate monitor to track your heart rate during exercise is the best way to measure your exercise effort. Your maximum heart rate is approximately 220 minus your age. (Some high blood pressure medications affect the maximum heart rate, so if you take such medication, consult your doctor.) Moderate intensity exercise raises the heart rate to approximately 50-69% of your maximum, and vigorous intensity exercise raises the heart rate to roughly 70%-89% of your maximum. When starting an exercise program, aim for the lower ranger of your heart rate target zone (50%) and gradually build up to the higher range (70%+). After six months or more, you may be able to exercise comfortably at the 70-89% range of your maximum heart rate. More information on exercise and target heart rates can be found at the American Heart Association website. Similarly, exercise increases BDNF (brain-derived neurotrophic factor), which may promote neuroplasticity. Historically, the medical field held the belief that the brain did not make major changes after a certain point in time. However, it is now known that the brain is actually capable of changing and developing throughout a lifetime. The term neuroplasticity is used to describe this tendency for the brain to keep developing, changing, and potentially healing itself. Vigorous exercise is currently considered as the best approach to encourage neuroplasticity. High intensity interval training, including boxing training programs, which also provides symptomatic benefit. Running and/or Brisk Walking – Heart rate monitors are recommended, especially for walkers. If your heart rate is not in the vigorous zone, push yourself harder. We’ve spent a lot of time focused on aerobic exercise and intensity levels. Indeed, most people focus on the first part of the exercise recommendation, clocking in their time. But strength training is equally important. For example, you might bicycle at 80 to 90 RPM for 60 minute sessions, 3 or more days a week, but that is only exercising a small subset of your body’s muscles. PD weakens your muscles, and the symptoms make you use some muscles less. But it is possible to gain strength, and build muscle, even with PD. If possible, I highly recommend that you see a personal trainer and/or physical therapist, even if they have no experience with PD. They can help ensure that you are strengthening all muscle groups, and avoid injuries that can slow or impede your muscle development. PD tremors zap arm strength. Fight back with free weights, resistance bands and push ups. Using weight machines is ok (and safer than free weights if you don’t have a spotter), but free weights are better for also helping balance, coordination and grip. PD wrecks havoc on your balance and increase the risk of falls. Core muscles (ab and lower back) are extremely critical to equilibrium and balance. Sit-ups, crunches, planks, ab rollouts … no one enjoys these exercises … but if they improve your balance, or make it easier to recover your balance, they may be one of the most important categories of exercise for someone with PD. PD generally effects one side more than the other, leaving an imbalance in leg strength. Walking, biking and jogging will help strengthen some of the muscles in your legs, but your might still have trouble getting out of a chair. Add leg squats to your routine. In my opinion, squats are as important as core exercises for balance. If you can’t balance well enough to do squats, grab a chair and do repeated sit-stand exercises. As you improve, find a lower chair (or use a weight lifting bench in a gym). If you’re doing squats without a chair or bench, keep trying to push your rear end lower. Widen your stance. Hold additional weights while you squat. And if you get real good at it, get a BOSU and do squats balanced on top of that. To improve strength, use progressive resistance exercise principles. This is a strength training method in which the load is gradually increased to allow muscles to adapt. Muscles adapt to exercise and need to be constantly challenged in order to continue to grow and change. As time progresses, you need to increase the weight, increase the number of repetitions between rests, increase the number of sets, and/or add additional exercises to target complimentary muscles. There are a lack of studies to conclusively state what is the best form of exercise, but that is probably because there is no single best form. A lot of experts say the best exercise is the one that you enjoy and commit to doing regularly. To some extent, I agree, let’s face it, any exercise is better than none. But I also think it is important to keep pushing yourself and improving your level of fitness. It is also critically important to do exercises that directly address PD issues of muscle weakness and balance, so do not neglect strength training. If you’re just getting started, go find a personal trainer to help guide you. Ask your local YMCA if they have any PD exercise programs. 2-1/2 hours/week moderate intensity or 1-1/4 hours/week vigorous intensity. Do some form of exercise every day for at least 30 minutes (5 or 6 days is OK). 5 hours/week moderate intensity or 2-1/2 hours/week vigorous intensity. If your body will let you, push it further. Very good work. I enjoy to read it. Interesting topic!